The American contribution to World War I is one of the great stories of the twentieth century, and yet it has all but vanished from view. Historians have dismissed the American war effort as largely economic and symbolic. But as Geoffrey Wawro shows in Sons of Freedom, the French and British were on the verge of collapse in 1918, and would have lost the war without the Doughboys. Field Marshal Douglas Haig, commander of the British Expeditionary Force, described the Allied victory as a "miracle"--but it was a distinctly American miracle. 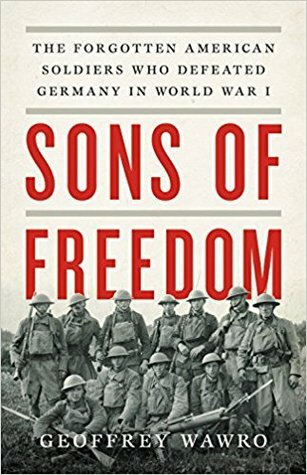 In Sons of Freedom, prize-winning historian Geoffrey Wawro weaves together in thrilling detail the battles, strategic deliberations, and dreadful human cost of the American war effort--first defending Paris, and then cutting the German army's lifeline in the Meuse-Argonne. A major revision of the history of World War I, Sons of Freedom resurrects the brave heroes who saved the Allies, defeated Germany, and established the United States as the greatest of the great powers.